Comprising but not limited to variously designed necklaces, etc. 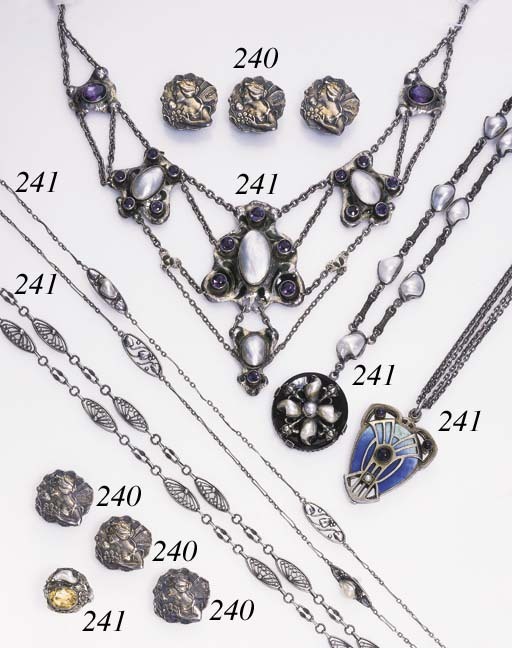 ; highlights include a necklace, designed as navette-shaped pierced openwork plaques spaced by textured and decorated link chain--60 in. ; an Arts and Crafts necklace, designed as a circular shaped black onyx and baroque pearl floral decorated pendant joined to a pearl chain, mounted in silver-(pearls not tested natural vs. cultured), 36 in. ; a necklace, of festoon style centering a oval-cut mabé pearl, green enamel and circular-cut amethyst geometric shaped plaque, suspending a similarly decorated plaque, linked by multiple chains to similarly decorated plaques, mounted in silver--18 in.